What’s your connection to Iraq? I want you to stop for a minute and really think about it, because I assume you can get there somehow. You know someone who was deployed there, or you’ve met a business person in the States who works there or emigrated from there. You’ve read a book or seen a movie about the Kurds or the Yezidis. You have memories linked to the fall of Sadaam Hussein. Or you know someone who has been there or who loves people there. Maybe I’m your link. But, I bet you have a link. Iraq may not be at the top of your news cycle any more, but the reality is that 2.8 million people are still displaced in Iraq, and 1.4 million of those were displaced just last year. How has this become a normal reality? How can nearly 1.5 million people be forced from their homes and we are none the wiser? The unfortunate thing about it all is that stories like this are playing out across the globe every day and we simply do not have the capacity to comprehend much less effect change in each of these tragedies. But you very well may have the capacity to make a bigger difference than you realize. A donation of $5, $10, $15 dollars might seem small to you, but every person who puts a dollar towards small work is sending a message that what we’re doing is worth something. That the work is not unseen, and that it does matter. Your support might be the difference between giving up and believing that we can actually keep going and make a difference. This summer Panaga Organization for Education was born and took over the operations of the Haven Center in Shariya, Northern Iraq. Friends, this is an INCREDIBLE team doing AMAZING work. I vouch wholeheartedly for their passion and perseverance in the work of helping their community to recover, rebuild, and move forward. We have continued to collaborate and work together on various projects, and EDGE especially has been working to use the programming that Panaga is committed to to help create resources and provide research to help further the work of Education in Emergencies. We’ve lately been working on drafting a field note to share the process of Pop-Up schools and the benefits we have seen from that. In reflecting on that, I am filled with gratefulness for how many positive impacts we have seen from the Pop-Up Programming that we have run in various towns and places in the Dohuk area and how many kids have been through that programming. The Pop-Up Programming, if this is new to you, focuses on providing gap-filling educational opportunities for out-of-school youth in areas where there is limited or no educational opportunities. Pop-Up Programming addresses and eliminates the primary reasons that parents do not send their children to school, including but not limited to cost, location, and uncertainty. The Programming itself focuses on social-emotional growth, trauma relief through art and play, and character development while also teaching fundamentals of language and learning. We are planning to fund the next session of Pop-Up near Shariya town. This funding will provide materials, transportation, and snacks for 40-75 students for two months of programming. The funding need is $750. What seems like a small amount can have such a huge impact on a community. 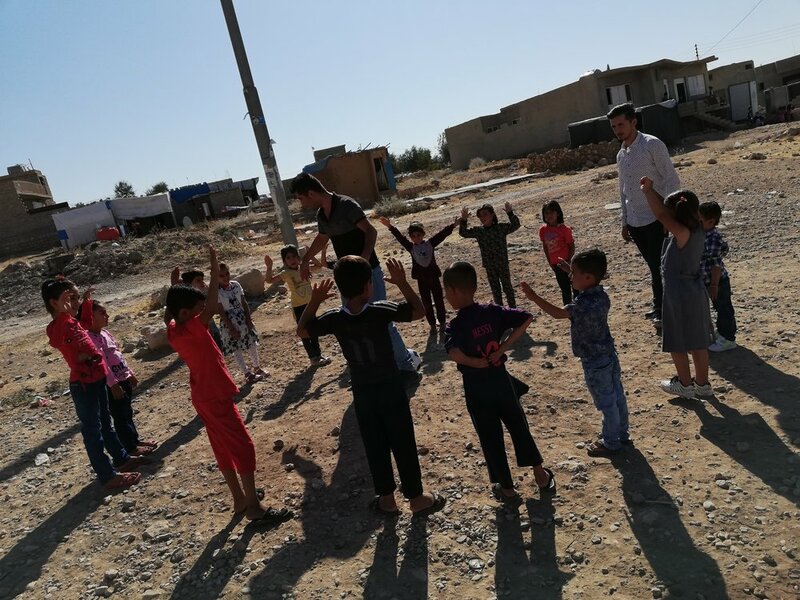 While we have the great privilege of seeing kids change, become more sociable, happier, and more confident in themselves, the bigger impacts of programs like this are when the entire family becomes happier, or learns better hygienic practices that keep them safe and healthy through the winter, or have a renewed hope that staying in Kurdistan could actually be a good move for them. Is your link to Iraq worth $10? Is it worth investing in the future of children, families, and communities there? Because I promise you that Panaga will manage your investment with love and will continue to show up where you can’t on your behalf. Interested in supporting Panaga regularly? Or interested in learning more about the research EDGE is currently working on? Feel free to email kylie.barker@edge.ngo for more info.